In South Louisiana there are plenty of Nanan’ (Cajun french for Marraine (godmother) and of course the Paran (godfather). The girl godchild is called “filleile” and the boy is called the “filleul’. My filleile loves to prepare this easy dish for her children. 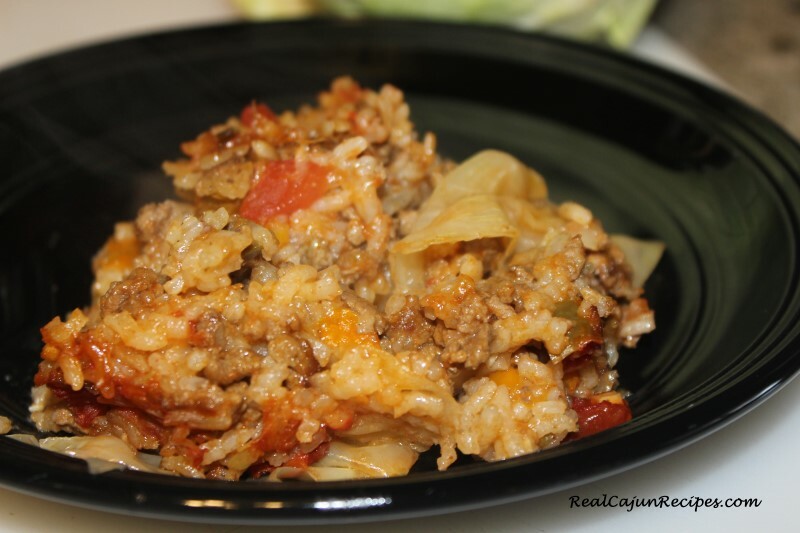 Make the casserole filling: In a medium skillet, brown the ground beef and sausage along with the bell pepper, celery, and onion. After all is brown and the vegetables softened, drain any grease and add the Rotel tomatoes, the chili powder, the diced cabbage and the 1/4 cup of water. Mix well and cook over medium heat for 5 minutes. Add the raw rice, mix well and pour into a 9x12 greased casserole dish. Make the cheese sauce: In a saucepan over medium heat combine the margarine, milk, flour and cheese. Stir until the sauce thickens. Pour over the casserole dish. Cover the casserole dish and bake for 1 1/2 hours. One visitor commented - "I always add a little black pepper and a little ground mustard to my cheese sauce. That’s the way my Momma always made it."